We’re here to help! If you need more information than these commonly asked questions and answers, contact us. What are Sunshine Burgers made from? Sunshine Burgers are made from 100% organic, whole food ingredients. We start with organic raw sunflower seeds and organic brown rice; other organic ingredients and herbs and spices are added to create seven distinctive flavors. What does Certified USDA organic mean? 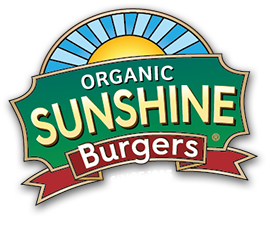 All Sunshine Burger Products are Certified USDA Organic. Do Sunshine Burgers contain Genetically Modified Organisms (GMOs)? Sunshine Burgers do not contain Genetically Modified Organisms (GMOs). GMOs are organisms (plants and animals) whose genetic material has been altered using genetic engineering techniques such as gene splicing. This experimental technology merges DNA from different species to create new combinations of plant, animal, bacterial and viral genes that cannot be formed naturally. Virtually all commercial GMOs are engineered to withstand direct application of herbicide and/or to produce an insecticide. Despite biotech industry promises, none of the GMO traits currently on the market offer increased yield, drought tolerance, enhanced nutrition, or any other consumer benefit. I have food allergies. Are Sunshine Burgers soy and gluten-free? What about nuts and dairy? Sunshine Burgers are a great choice for many people who have food sensitivities and allergies because they are free of: gluten, wheat, soy, corn, oats, dairy, eggs, treenuts and peanuts. Do you test Sunhine Burgers for the presence of gluten? Yes. We test all Sunshine Burgers periodically for the presence of gluten to 5ppm with none detected. Our products are made in a limited employee access “plant within a plant” with a dedicated production line which handles only Sunshine Burgers; the production line is thoroughly washed daily. However, wheat flour is used in other parts of the production facility. Yes, all Sunshine Burgers are vegan with a delicious taste that can be enjoyed by all eaters. Vegan foods are entirely plant-based foods meaning they do not contain meat, eggs, dairy products or any other animal-derived ingredient. Sunshine Burger creates vegan burgers because we want to offer organic whole food ingredients that are good for you and the planet. Where can I buy Sunshine Burgers? Sunshine Burgers are available nationwide at select retail stores. Visit our Find a Store page for a complete list of locations. Can I order Sunshine Burgers online? Right now you cannot buy directly from Sunshine Burger (the cost of overnight delivery is too expensive), however we are available in leading natural and conventional foods stores across the country. Visit our Find a Store page for a complete list of locations. How do I get my local grocer to carry Sunshine Burgers? Submit a written request in the retailer’s suggestion box. You can also let us know where you would like to see them by sending us an email from out contact page. How do I reheat Sunshine Burgers? Stove Top: Place frozen burger in a covered frying pan on low heat, warm 3-5 minutes on each side. Conventional/Toaster Oven: Preheat oven to 375 degrees and heat frozen burger about 5-7 minutes. Microwave Oven: Wrap frozen burger in a damp paper towel, place on microwave-safe dish and heat on high for 60-75 seconds. BBQ Grill: Place frozen burger on grill for 3-5 minutes on each side, brush with BBQ sauce if desired. Keep away from direct heat. Crumbles: Thaw frozen burger, then crumble and reheat for use in salads, tacos and casseroles. How long will Sunshine Burgers keep after thawing or reheating? Sunshine Burgers are made with only organic whole food ingredients. This means they have no preservatives and should be consumed as soon after reheating as possible. They will keep for several days after thawing. Trust your nose and eyes: if they don’t look or smell right, please don’t eat them. What are some additional serving suggestions for Sunshine Burgers? There are many wonderful ways to enjoy Sunshine Burgers. Please visit our recipe page to explore more ideas. What is the best way to store Sunshine Burgers? In the freezer. Frozen burgers are ready to heat and eat. How do I determine the expiration date on the packaging? The expiration date is on the bottom of the box. We refer to the expiration date as the Use By: Date. This information is next to the UPC code. Do you offer coupons for any of your products? Occasionally. If you would like coupons for Sunshine Burgers, please sign up here or send us a self-addressed, stamped envelope and be sure to include your email address for future offers. We will send you some coupons. Write to: Sunshine Burger Coupons, 701 Jones Avenue Fort Atkinson, WI 53538. How can I share a suggestion or idea with your company? We would love to hear from you. Send an email from our contact page, or mail to: Sunshine Burger 701 Jones Avenue, Fort Atkinson, WI 53538. Why did you introduce a bigger Original Sunshine burger patty? To cater to our hungry fans, we made the Original Sunshine Burger bigger. The new Quarter Pound Original has the same great taste and uses the same ingredients as the Original Sunshine Burger. Now there are two, 4-oz patties in each box! Did Sunshine Burger make some recent changes to its packaging? Yes, we did and thank you for noticing! Besides our new attractive packaging, we’ve added a new flavor – Shiitake Mushroom. Plus, we decreased the amount of sodium used in our recipes and have added additional nutritional information to our packaging and website. We have added nutritional information about iron, folate, zinc and magnesium, all-important nutrients for men, women and children. What happened to the All Natural Original Sunshine Burger? Short Answer: Now it’s the certified Organic Garden Herb Sunshine Burger. The Details: First, the 2.67oz All Natural Original Sunshine Burger is no longer available as an All Natural item BUT it is still available as our Organic Garden Herb and as an Organic Quarter Pound Original Sunshine Burger. Here’s the story: years ago, before organic certification, we only made “Sunshine Burgers” — one flavor fits all. Then when organic certification became a reality, we had two products: “All Natural Original” and “Organic Original” (still only one recipe–we added the South West, BBQ, Breakfast and Falafel flavors later on). We felt it was necessary to keep two separate items because we were not always able to obtain certified organic ingredients. Later, when we designed new packaging, the All Natural Original stayed just that but the “Organic Original” became “Organic Garden Herb.” More recently, we discontinued using conventional ingredients and source only certified organic ingredients but continued to make both the Original and Garden Herb (so the two were identical except for the box). In March 2012, we totally revised our packaging and this time we completely repositioned the “Original.” Now it is Certified USDA Organic and, to give it a meaningful difference from the Garden Herb (and to satisfy all those people who asked us to make a bigger veggie burger), we made it into a Quarter Pound Original. Many of our distribution customers started buying the new Organic Quarter Pound Original Sunshine Burger, so we hope you are able to find it on your grocer’s shelves. In the meantime, please consider the Garden Herb Sunshine Burger a worthy alternative.